Tollfreenumber.org offers small business owners a convenient and affordable way to attract new customers with toll free phone numbers. Proven for years as one of the most effective ways companies attract new customers, toll free telephone numbers are now available online for small business owners too. This tried-and-true marketing tool had historically been too costly for smaller businesses to utilize. But now that has changed: Tollfreenumber.org provides an affordable option for anyone looking to promote and expand their business. Toll free numbers extend market reach and increase potential clients by providing a free connection not equated with a particular region. Often, customers lose interest if they see an area code they don't recognize. Toll free numbers eliminates that concern, expanding the market for any business. Small businesses can also take advantage of vanity numbers, toll-free numbers that form a word or phrase to help convey a company's marketing message. For example, 1-877-EXIT-210 is used by a casino to communicate its location. The toll free number, which tells prospective gamers which exit to take, has successfully attracted new visitors. This unique and valuable phone service is now available through tollfreenumber.org. To register for a new number, business owners simply sign on to the website, search available numbers and sign on for service. This is an exciting new option that is fast becoming the most powerful marketing tool available to small businesses in years. Continue reading article at ABC business News - Click here. 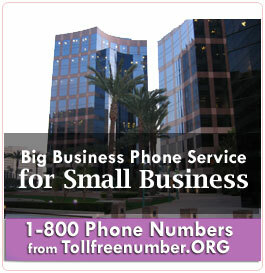 Order your own toll free numbers from: Toll free number .org or for 800 area codes.